If you know Tim and me, you know that we could eat sushi every single day of the week. We love it! 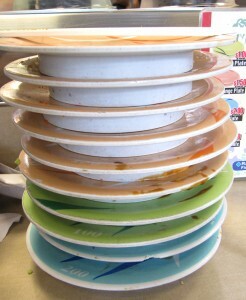 One of our favorite places to each sushi is Marinepolis Sushi Land, because it is the cheapest sushi in Seattle. 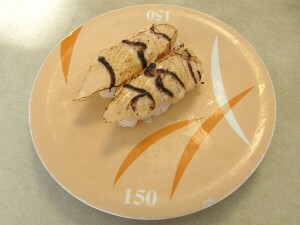 The conveyor belt style sushi joint offers decent sushi at a killer, cheap price. We never go wrong with a stop at Sushi Land. 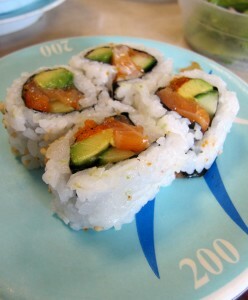 Salmon and avocado roll at Sushi Land. Sushi Land has a number of locations across the Northwest, but Tim and I visit the Lower Queen Anne location (805 5th Ave. N.) and the Bellevue location (138 107th Ave. NE) most often. Both offer the same type of sushi at the same great price. There are four price points at Sushi Land. Green plates cost $1, orange plates cost $1.50, blue plates cost $2, and purple plates cost $3. With the most expensive thing on the menu being just $3, Tim and I can typically get stuffed on sushi for about $20 altogether. That’s not bad for two people. Our favorite thing to get at Sushi Land is seared salmon. One of our favorite things to get at Sushi Land is the seared salmon. While I’ve seen it come through on the conveyor belt a few times, we typically have to order it because it is so popular and never seems to stay very long on the belt. Each plate of seared salmon costs just $1.50 (orange plate). The seared salmon is like candy to me. I could eat it all day long. The fact that it’s so cheap and tastes so good means Tim and I typically get a few orders when we visit Sushi Land. Some of our other favorite menu items at Sushi Land include the California roll, shrimp tempura roll, spicy tuna roll, and prime tuna gunkan (which is raw tuna with onions wrapped in seaweed). Just like the seared salmon, if you don’t see something on the conveyor belt that you like or are looking for, the chefs are more than willing to make something for you. Sushi Land also does take out sushi. While Tim and I have never taken our food to-go (we think the place is already so fast and convenient that taking it to-go isn’t necessarily) we’ve seen a lot of people do this. 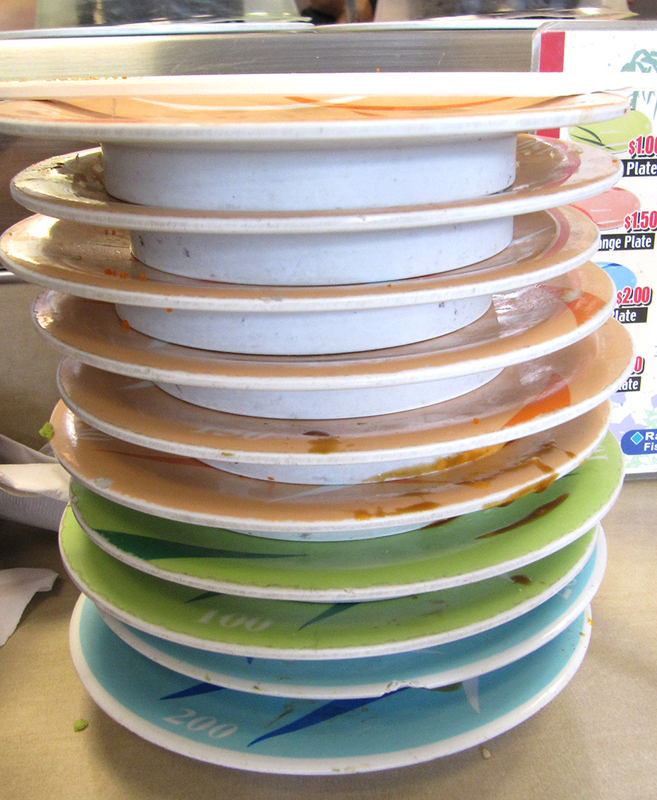 This equals $15 worth of sushi at Sushi Land. As you may expect from a cheap sushi place, the sushi at Sushi Land won’t totally blow your mind with incredible, over the top sushi, but it will definitely cure any sushi craving you have. 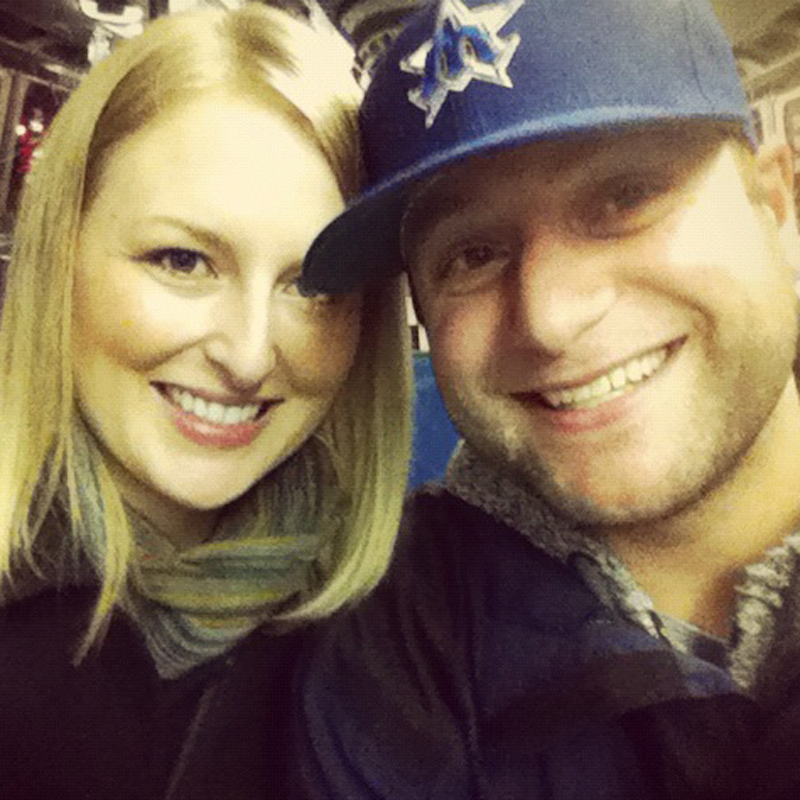 We love this place we’ve affectionally dubbed the fast food of sushi and plan to keep going back. Have you ever dined at Sushi Land? Do you agree that it’s the cheapest sushi in Seattle? If not, where do you go for the cheapest sushi in Seattle? Please let us know! You can simply leave a comment below or connect with us on Twitter, Facebook and Google+. We can’t wait to hear from you!